We’d love your help. 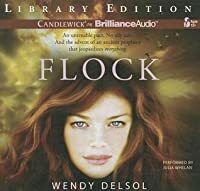 Let us know what’s wrong with this preview of Flock by Wendy Delsol. Although tricked into the initial deal, Katla is constrained by a celestial bargain that puts everyo Having barely survived an eleventh grade of adventures rivaling any mythological tale, human Stork Katla Leblanc is hoping for an ordinary senior year. But when two Icelandic exchange students turn up at Norse Falls High, an uneventful school year seems out of the question. To ask other readers questions about Flock, please sign up. What to say about the final installment in the Stork series...I kind of have mixed feeling about it. I enjoyed the overall plot, but the way the story was carried out, or should I say written, made me want to scream in frustration. The first half of the book was great. I loved immersing myself into Katla's world. The addition of two previously met characters more fully into the story was promising and I loved following Jinky and Marik. The plotline was interesting, Katla was faced with several p What to say about the final installment in the Stork series...I kind of have mixed feeling about it. I enjoyed the overall plot, but the way the story was carried out, or should I say written, made me want to scream in frustration. The first half of the book was great. I loved immersing myself into Katla's world. The addition of two previously met characters more fully into the story was promising and I loved following Jinky and Marik. The plotline was interesting, Katla was faced with several problems that relied on her to be solved and knowing what she was capable of from the previous two books I had high hopes that Flock would turn out to be an exciting read. Unfortunately, the second half is another story. All the things I loved in the first half of the book, became frustrating and annoying in the second, there was just too much of Katla's inner ramblings and heritage information. A lot of that information was either unnecessary or too complicated to remember for the duration of the book. That coupled with Katla's failure at playing a more proactive role in the predicament that she's found herself in, made reading Flock dull, disappointing and as I've previously said, frustrating. I kept waiting for her to do something toward solving the problem, for the plot to move somewhere but it didn't till the very end. The final showdown with the queens of realms came practically out of nowhere and I still don't know what the heck happened at the end and why was Katla so confident in saying that it's over, the danger has passed and won't come back again. I did however like the ending, or rather the twist with Katla's abilities as a Stork. Even in the previous books I found Kat to be careless and not responsible enough about her duty and responsibility as a Stork, so I was pleasantly surprised by that twist. Wow, I loved FLOCK! Thank you so much to Candlewick for the ARC. I seriously couldn't wait. So, relish in these pages, dive into this mythological world of incredible powers and root for Kat as she's once again put into life and death circumstances. LORD HAVE MERCY WHAT AN ADVENTURE THIS SERIES HAS BEEN! With that said in yes all shouty caps I have to do a recap of all the books that lead up to this EPIC conclusion. I know I know some people did not like the series but to each his own. I really enjoyed this series because it had a little of everything and when a book uses myths I just adore it. Wendy did a wonderful job of weaving a world that went from the ordinary to the extraordinary. If you are looking for a good series to read this is LORD HAVE MERCY WHAT AN ADVENTURE THIS SERIES HAS BEEN! With that said in yes all shouty caps I have to do a recap of all the books that lead up to this EPIC conclusion. I know I know some people did not like the series but to each his own. I really enjoyed this series because it had a little of everything and when a book uses myths I just adore it. Wendy did a wonderful job of weaving a world that went from the ordinary to the extraordinary. If you are looking for a good series to read this is it. In Stork we meet Katla who is moving from LA of all places to small town Minnesota. When she gets there she soon finds out that things are not always as they seem and she finds out that she is part of a secret women's society called the Storks. Then to make matters worse she fools around with the schools jock Wade and he turns out to be such a jerk that she regrets fooling around with him.Then she meets Jack the editor-in-chief of the newspaper and she is excited to have a friend. Being the new girl stinks real bad so she and Jack become quick friends and find themselves liking each other.That is when she finds out she belongs to the Stork society and Jack is a descendant of The Winter People. Then is Frost Katla and Jack are a couple but being a couple with their secrets is hard. All Katla wants to do is have a good year at school and build on her relationship with Jack and her best friend Penny. She is looking forward to Christmas but as all good books go drama is around the corner in the form of a girl named Bridgid. Jack creates this storm for Katla and when he does it reeks havoc on their relationship. With everything going on in Katla's life she does not need this. To make matters worse after Jack creates the storm he and Bridgid start to get close and Jack starts distancing himself from Katla. Katla soon realizes that Jack has been taken by the Snow Queen and she will do everything in her powers to get her man back. As Katla struggles to get Jack back she will find that somethings are worth sacrificing for. That brings us to the EPIC ending of the series Flock. Katla has survived so much in just a short period of time that she is looking forward to having some down time with Jack and her BFF Penny. She wants to spend Christmas just hanging out and relaxing and getting some quality time with Jack. But as we all know evil never rests and Katla will see just how evil the new exchange students are. They will stop at nothing to destroy everyone and anything Katla loves or cares about. She will have to fight them with all her powers and she will have to lose some and gain some but in the end she will fight for what is right in order to keep her family and friends safe from evil. Wendy has done a fabulous job wrapping up this series and when you get to the end you will be screaming at the outcome I know I was! 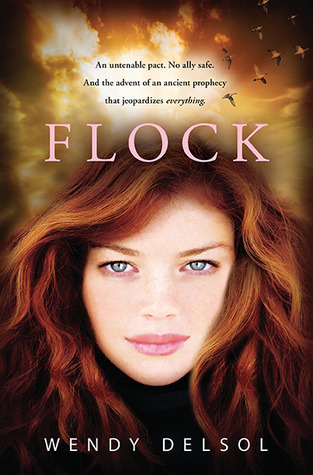 I have to start by mentioning the cover of Flock. Is it not the most gorgeous cover ever? Does her hair not have the most perfect waves you've ever seen? The colors, the birds in the background... it's all just so stunning. Well done, Candlewick designers, well done. That's not the only good thing about this book. Flock is a fabulous finish to one of the most surprising trilogies I have come across in the inflated YA paranormal market in recent years. I love that Katla is a Stork, and member of a I have to start by mentioning the cover of Flock. Is it not the most gorgeous cover ever? Does her hair not have the most perfect waves you've ever seen? The colors, the birds in the background... it's all just so stunning. Well done, Candlewick designers, well done. That's not the only good thing about this book. Flock is a fabulous finish to one of the most surprising trilogies I have come across in the inflated YA paranormal market in recent years. I love that Katla is a Stork, and member of a sisterhood of various birds and deliverers of souls. It's refreshing, interesting, and thought out. The first book, Stork, was brilliant and left me feeling very satisfied at the end. Then there was the second book, Frost, which carried the same interest level, but stray far from the stork ideas presented in the first book. We met new characters and developed Katla's circle of friends in a different but still enjoyable read. Now Flock joins both worlds seamlessly. Katla truly has a lot at stake in this final book. There is her relationship with Jack, her duties to the Storks, her frail little sister Leira, and on top of it all, the evil presence threatening to take over her small town folks. Through it all she maintains her sense of humor, one of my favorite parts in the writing. I was expecting to be annoyed with the heightened roles of Marik and Jinx, but they surprised me with their contributions to Kat's life. Even Penny and Kat's Mom turned things around with their smaller roles. The ending is brilliant, powerful, and perfect. Wendy Delsol has landed a unique, well-written, and well thought out trilogy. In the final book of the Stork series, Katla LeBlanc, a member of a secret society of soul deliverers, must yet again stop the Ice Queen from bringing about the end of the world. Hoping to have a normal senior year, Katla and Jack’s world gets turned upside down with the arrival of Marik and Jinky when she learns that she has inadvertently promised her newborn sister to the Water Queen and that Marik is there to collect. Katla is a likeable heroine and this story does a good job of incorporating In the final book of the Stork series, Katla LeBlanc, a member of a secret society of soul deliverers, must yet again stop the Ice Queen from bringing about the end of the world. Hoping to have a normal senior year, Katla and Jack’s world gets turned upside down with the arrival of Marik and Jinky when she learns that she has inadvertently promised her newborn sister to the Water Queen and that Marik is there to collect. Katla is a likeable heroine and this story does a good job of incorporating different Nordic myths and legends into the plot. At times however, the legends seem to run together and the names tend to get confusing. While the plot does flow more smoothly than the previous book in the series, there are a lot of sub-plots that never come to fruition and a lot of loose ends that never get answered. Towards the end of the book, the main conflict seems resolved much too conveniently and readers are left never really knowing what happened. Students in grades 7 and up will definitely enjoy this book if they have read the other two in the series and will be pleased with the final outcome. This book is optional purchase, assuming you have the rest of the series in your collection. I've said this before about this series, it is so original! I love it. The covers are so beautiful; "frosting" on the cake. Yep, I punned it, so what! Once again we have Kat in a messy situation with some Nordic baddies. The modern references, as in the previous books, hit just the right spot to make the book relatable. One thing I really missed was Kat's inner dialogue. She didn't seem to have as much in this book as she did in the others. We don't see as much interaction with Kat & Jack either. This is a bit sad because if you read the first two books you absolutely fall in love with Jack as well as their relationship. I enjoyed Marik and Jinky coming back in this book. Watching Kat & Jinky's relationship evolve was interesting. I desperately wish Kat and Jack didn't need to lose what they did (no I won't say anymore as to avoid spoilers), but I see it had to be. I hope maybe we'll see another series where they might get it back. Over all, I think this was a great end to an amazing series. I want to reiterate...if you are looking for something different in the YA genre read this series! Imagine stuff like that every other page. It gets old. While this was a fitting end to an excellent series, I felt this story wasn’t quite as strong as the other two. I felt like everything was rushed, not enough depth was given to much of anything, and the conclusion of hostilities amongst realms was too fast and not explained well enough for a complete understanding of what happened. At the conclusion of the book, I was happy with the very ending. Happy with how everything worked out, and how the story closes. But I also had a feeling of what-the- While this was a fitting end to an excellent series, I felt this story wasn’t quite as strong as the other two. I felt like everything was rushed, not enough depth was given to much of anything, and the conclusion of hostilities amongst realms was too fast and not explained well enough for a complete understanding of what happened. At the conclusion of the book, I was happy with the very ending. Happy with how everything worked out, and how the story closes. But I also had a feeling of what-the-heck-just-happened – almost a whiplash or something. I would have liked to see more plot development surrounding the exchange students, and better explanation of Kat’s sacrifice. This book wrapped up things, but I am not sure how I feel about the ending. I was surprised that there wasn't much with the Storks, something I really liked about this series. What little there was with them left me feeling like they were under utilized and that Kat's role with them was glossed over. I did like how Kat reached out for help when she needed it and that those that were disappointed with Kat helped her. I hated how Kat felt like she had to hide things from everyone, especially Jack. This book wrapped up things, but I am not sure how I feel about the ending. I was surprised that there wasn't much with the Storks, something I really liked about this series. What little there was with them left me feeling like they were under utilized and that Kat's role with them was glossed over. I did like how Kat reached out for help when she needed it and that those that were disappointed with Kat helped her. I hated how Kat felt like she had to hide things from everyone, especially Jack. Those two have been through so much together it that it bothered me. I did like how Jack reacted, loved that he didn't listen to what Kat was saying. This was one of the best endings to a book series I have ever read. The Stork Trilogy was a great mixture of fiction, romance, and high school life. Though the end did have an interesting twist, but the the two lovers still ended up together, even though they had obstacles in their path to be together. I really do hope that Wendy Delsol continues to create amazing books because I will surely read them. Expected publication: September 11th 2012 by Random House, Inc. I have mixed feelings towards this book. The beginning was not good. The writing style was erratic and too full of commas. It was very distracting. Once you got past the first 50-75 pages the pace picked up and it became one of the books I couldn't put down. BUT the ending was terrible. Everything wrapped up into a nice little bow, but it did so in the least satisfying way imaginable. I don't know how to feel about this book. I think overall I give it a meh. It was a 4 star until the end. The end kind of ruined the whole series for me, which stinks because I love the series. Just one certain aspect that happened to Katla and Jack really really messed with my feelings for the story. And it stinks. But overall, what a great series. A satisfying conclusion to the Stork trilogy. Ending was not as epic as I'd hoped. As a Lark I feel that I didn't stand a chance against the series. How could I not fall in love with a world that has so many bird references? I picked up Stork on a whim and since then I have enjoyed every moment spent in the fascinating and magical world of Norse Falls. This book was a difficult one for me because I am not ready to say goodbye to these characters that I have grown to love. I tried to read it slowly and savor every moment, but that didn't last long as the action began to pick up. I ended up devouring the book in a span of two days. It's always bittersweet when you read that last sentence in a beloved series. I'm already trying to figure out when I have time to do a reread of the entire series. I had super high expectations for Flock and Delsol didn't let me down. She delivered everything I wanted and more. Flock picks up right where Frost left off as Kat is starting her first day of Senior year. I have learned that nothing with Kat is boring or simple so even this run-of-the-mill right of passage is epic for her. Not only is she dealing with college decisions, a new stepdad, and a sick baby sister, but she's also trying to keep her romance with Jack burning brightly AND trying to save the world as an ancient prophecy breathes down her neck. It's a lot for one teen to handle, but Kat manages to attack her issues with courage and style. You'll have to read this one to find out more about the plot, but I promise it's as full of mythology and epic adventure as the previous books. Delsol ended this fabulous series with a bang. As hard as it is for me to accept that's it's over, I am happy to say that Delsol did a beautiful job wrapping things up. I think all fans of the series will be pleasantly surprised by this one. There were certainly elements I could never have predicted running throughout this one. I also really liked that Penny gets more of a role in this one. She was important in the previous two books, but I feel like she truly steps into her leading lady shoes in this installment. It was awesome to think about how much she has grown since the beginning of the series. Penny has gained confidence and she isn't afraid to speak her mind. I feel certain that she can now hold her own with Grim any day. It was also nice to see more of the relationship between Kat and Jack evolve. Every girl needs a Jack in her life. He always has Kat's back - even when she tries to push him away. He's the hero we all dream about as little girls. I also like that while their romance is sweet and passionate it is still pretty chaste. I've always been a fan of leaving more to the imagination where romance is concerned. Kat and Jack certainly have that once in a lifetime kind of love going on. I seriously could gush about this book all day. I love everything about it - the characters, setting, writing, and mythology. I want to buy a house in Norse Falls and hang out with Kat, Jack, and Penny on the weekends. Sadly, it's not a real town and these aren't real people, but Delsol crafts them in such a way that everything (even the fantasy elements) seem real. Norse Falls is a place I love to spend time in and hope to revisit frequently in the future. If you haven't started this series, I highly recommend it. These books are clean, fun, and adventurous. I'm already planning ways I can encourage my students to try these books out. I'm also excited to see what Delsol will write next. She has secured herself a loyal fan in me. One Last Gripe: I liked the ending, but it totally took me by surprise. It took me a bit to settle myself into it and realize it was the best possible way for things to end. First Sentence: Spending the morning ball-and-chained to a new kid was not my idea of a good kickoff to our senior year. Favorite Character: I can't choose just one! I love Kat, Jack, Penny, Marik, and Jinky. Even the villians in this one appeal to me. The conclusion to the Stork trilogy, the first two of which I read a few years ago so they're not totally fresh in my mind. Katla is a "stork", in charge of guiding souls into vessels (i.e., guiding the right babies to the right mothers) along with a number of other women in her small town, which is pretty much a hot spot of Norse mythology come to life. At the beginning of her senior year, two exchange students that she knows appear at her school, Jinky and Marik, sent to make sure that Kat ful The conclusion to the Stork trilogy, the first two of which I read a few years ago so they're not totally fresh in my mind. Katla is a "stork", in charge of guiding souls into vessels (i.e., guiding the right babies to the right mothers) along with a number of other women in her small town, which is pretty much a hot spot of Norse mythology come to life. At the beginning of her senior year, two exchange students that she knows appear at her school, Jinky and Marik, sent to make sure that Kat fulfills her end of a bargain that she unknowingly made, giving her baby sister up to the Snow Queen as an heir. Kat can't tell anyone, including her boyfriend Jack, about the deal so she's caught in the middle of a supernatural war that appears to be brewing and doesn't know who to trust. As soon as I started this book, I was reminded of what I'd liked about the previous books in the trilogy: the Norse mythology was a lovely backdrop to the story, and I loved the setting of Norse Falls that has so many people completely involved with the Norse mythology and yet others completely unaware of its existence. I really enjoyed the dynamic of this, and I liked the fact that the mythology/paranormal aspect did not overtake the more contemporary parts of the story. This was a story about Kat and her friends and family, with the Norse mythology just happening to be present as well. The balance was incredibly well done. There seemed to be a lot at stake in this book, and I was intrigued by the mystery - especially in the first half of it. The appearance of Jinky and Marik seemed very cut and dry at first, with them obviously the "bad guys" for wanting to take Kat's sister, but they ended up developing personalities that went far beyond the typical "villain" mindset. There seemed to be an understanding, if not a friendship, that eventually developed between Kat and each of them, separately, and I liked this a lot. The other friendships in this book were also done nicely, although I did feel like the relationship between Kat and her boyfriend, Jack, was not especially interesting - probably because things seemed to be just really smooth between this, which was nice but more of a very minor subplot than anything else. The romance aspect of this book was definitely not a big one. At times, especially in the second half of this book, the plot seemed to get slightly more complicated than necessary, to the point where I didn't always know what, exactly, was going on. I had to reread a few passages more than once to try and figure out what had happened. Even when I finished the book, there were parts that I was confused about and am still not sure of. It was satisfying nonetheless, probably because the book ended on a nice note and kind of summed up what had happened, but I do wish I had better understood certain climactic moments so I could have enjoyed them more! Things just happened so quickly and explanations given were not always clear. This review has been hidden because it contains spoilers. To view it, click here. I'd say that this is a nice conclusion to the series, even though it really wasn't what I was expecting. And I guess, I didn't really like it either. When I read that Marik and Jinky were transferring to Norse Falls High, I had guessed that Marik would be paired with Penny. And boy, did he. But I don't really like this matching, as much as I like Marik. I don't really like Penny (I was okay with her, but my dislike for her gradually grew in this book - she's like a different person). I feel like I'd say that this is a nice conclusion to the series, even though it really wasn't what I was expecting. And I guess, I didn't really like it either. When I read that Marik and Jinky were transferring to Norse Falls High, I had guessed that Marik would be paired with Penny. And boy, did he. But I don't really like this matching, as much as I like Marik. I don't really like Penny (I was okay with her, but my dislike for her gradually grew in this book - she's like a different person). I feel like the focus of this book was more on Penny, rather than on Kat or Jack, especially the latter. This, unfortunately, is a far cry from her role in the series in the other two books (although Kat's best friend, her role was quite tiny). After reading Frost, I was a tad grumpy cause I didn't get my dose of Jack. That being said, I understood how he couldn't be in the picture due to circumstances. So I was really hoping that I'd be able to see more of Jack and Kat in this last book. Unfortunately, I didn't get my wish granted and since I'm a big fan of romance... This book thus didn't meet my expectations. Rather than being Kat's love interest, I felt like Jack was more of a supporting character here. Even the role of being Kat's sidekick was awarded to dear Marik. So what's really left of Jack? He finally comes back into the picture at the end, and... loses his powers. His Jack Frost abilities that were uber cool. Penny, on the other hand, I felt like she's changed. She grew to be another person, another character in the book. Suddenly she's "drooling" over the new guy and then she nominates herself for Homecoming queen... okay. But there aren't any explanations to these. I actually had thought that she was kinda like a queen bee during the scene Jinky and Kat were over at her house, the one whereby they were talking about the keepsafe. I really don't like this Penny. So I guess, I would have been okay with her if the attention of the book wasn't on her but... it wasn't. Then all of a sudden, Marik's into her. But it doesn't makes sense because the only indication he was okay (and not infatuated with her) was because she wasn't "ugly". But it wasn't even explained what he meant by ugly. Thus I have questions regarding this aspect. That, plus me liking Marik... so I'd rather he didn't like Penny. I thought it'd be nice if he had liked Kat instead, since it'd make so much more sense as they spend more time together. Lastly, it's totally cool with me that the two lost their powers - Jack can finally go Cali, although he doesn't have the immune-to-the-cold thingy anymore (I thought that was cool). But what I hadn't liked was (again, I'm being biased because I don't like Penny and was irritated by this) that it was revealed that she, of all people, was the one to replace Kat as a Stork. That didn't sit well with me, alright. I liked this series a lot! I have always been fascinated by mythology and the ideas/beliefs woven into these books, but they tackle the subjects in a way different from that of Percy Jackson and such, which is nice (even though those are wonderful as well). Towards the end, it did start to become just the tiniest bit too unbelievable, but not with the storyline - with Katsa. But overall, it's a trilogy I haven't and won't be forgetting anytime soon! What I Liked: 1) Well, the first two books have focused a lot of their energies (or plotlines) on some of the Nordic legends, of which were all unknown to me. And I loved that about it. But this one focused more on how those legends were being rewoven into today's time period, and what effects they were having on Katla and her generation. I really love how Miz Delsol took her story a step beyond just retelling these somewhat obscure legends. 2) This is kind of an extension of the first thing I m What I Liked: 1) Well, the first two books have focused a lot of their energies (or plotlines) on some of the Nordic legends, of which were all unknown to me. And I loved that about it. But this one focused more on how those legends were being rewoven into today's time period, and what effects they were having on Katla and her generation. I really love how Miz Delsol took her story a step beyond just retelling these somewhat obscure legends. 2) This is kind of an extension of the first thing I mentioned, but I like how well Flock brought Stork and Frost together. The story continues from where we left off in Frost, but instead of feeling linear, it felt more like....well, I don't know if I can accurately describe it, but this is how I see it in my head. It was this: (visit Fuzzy.Coffee.Books to see these graphics. That may not make any sense to anyone, but it was as if she took the legend from book 1, and the legend from book 2, and brought them together to create a new story. I hope my visual aids depict that! (I'm quite the graphic artist, can't you tell? ;-)) 3) Complications. I enjoy fluff pieces of literature as much as the next person, especially when I don't want to think about anything. But I always appreciate complicated story lines with many twists and tangles, so I loved that part of this conclusion. Everyone's lives were all tangled around everyone else's, so the consequences of different actions were widespread. It wasn't just Katla and her decisions anymore. 4) The ending. It was a little bittersweet, which is always nice. Everything comes with a price, and Katla and Jack have to learn that. I'm glad for the ending that they received, it fit with the complexity of the story and felt very natural to the progression. What I Didn't Like: There are a couple of things that I mentioned being a little disappointed in with the first two books, and I'm glad to see that all of those were cleared up with this final piece of the puzzle. As for this one, nothing sticks out at me that I just didn't like about the story. I can't believe the final book in the Stork trilogy is finally here. I am sad to see this trilogy come to an end but I really liked the way it all ended. I thought this book was better than the second one- I really enjoyed it! We got to see lots of new characters, which I think was awesome. I think that was just the thing missing from book 2. The new additions breathed new life into the story. Kat is just such a determined girl. She does not give up, which is so admirable. Even if she doesn't al I can't believe the final book in the Stork trilogy is finally here. I am sad to see this trilogy come to an end but I really liked the way it all ended. I thought this book was better than the second one- I really enjoyed it! We got to see lots of new characters, which I think was awesome. I think that was just the thing missing from book 2. The new additions breathed new life into the story. Kat is just such a determined girl. She does not give up, which is so admirable. Even if she doesn't always follow the rules. Plus she has this cute little snarky streak in her that I really found amusing. And Jack made me smile again! He showed me why I loved him so much in the first book. That in itself made me super happy. Flock is a surprising end to an adventurous trilogy. I didn't see a few things coming in this installment. And one of them was pretty big! I'm not going to say a word though, you will just have to read it for yourself to find out. And then once you do, let me know if you like it or not. Personally I did like it, even though it bummed me out a little bit. But I think it was fitting. The Stork series is a fun series to read. It's full of Norse mythology, romance, and growing up. I adored Katla and Jack's relationship. And I'm kind of bummed that the series is all over now. Katla, as we find out in Stork, has an ability to unite unborn souls with potential vessels (or moms in modern-day terms). She's quite powerful and somehow has a knack to get herself into a lot of trouble. Jack, on the other hand, is descended from Jack Frost. Basically, he's your winter weatherman machine. The Stork series is a fun series to read. It's full of Norse mythology, romance, and growing up. I adored Katla and Jack's relationship. And I'm kind of bummed that the series is all over now. Katla, as we find out in Stork, has an ability to unite unborn souls with potential vessels (or moms in modern-day terms). She's quite powerful and somehow has a knack to get herself into a lot of trouble. Jack, on the other hand, is descended from Jack Frost. Basically, he's your winter weatherman machine. Did I mention this is all set in the freezing cold Minnesota? Anyways, onto this book. It focuses on Katla's emerging powers and her attempts to slow down the end of the world (as she sees it). So many things happened in the first and second books. And this book focuses on wrapping that up and leaving us with a happy ending. And can you guess who's on the cover? I had it figured out at the beginning but never understood why until the last ten pages. Yes, that means I did not have all of the twists and turns figured out in this one. And that ending? Woah! I'm having one of those moments where I want to gush and gush, but I can't. I can't ruin it for potential readers. While I definitely did not want the ending to happen the way it happened, it truly was the perfect ending. So yes, I have mixed emotions. Probably 3.5. This is a good ending to the series (a cute, clean, fun series!!). I was a little confused by what exactly was happening in the final confrontation and how it led to the results it did ((view spoiler)[Kat and Jack losing their powers and the end of the world NOT happening? Huh?! (hide spoiler)]), but I enjoyed the overall story anyway. I absolutely love Kat’s internal voice and narration--she’s so funny!! And I liked Jack MUCH more in this book than the last one. The other characte Probably 3.5. This is a good ending to the series (a cute, clean, fun series!!). I was a little confused by what exactly was happening in the final confrontation and how it led to the results it did ((view spoiler)[Kat and Jack losing their powers and the end of the world NOT happening? Huh?! (hide spoiler)]), but I enjoyed the overall story anyway. I absolutely love Kat’s internal voice and narration--she’s so funny!! And I liked Jack MUCH more in this book than the last one. The other characters are all great, too. I love the community/”village” feel to these books--how you get to know all the various people and personalities who impact Kat’s life. And, as before, I enjoyed the different legends/myths the author uses to tell the story. The ramifications at the end of the book were surprising and, I thought, rather bittersweet ((view spoiler)[I was rather sad that Kat wasn’t a Stork anymore and that Jack no longer had his powers. It seemed like they were diminished--part of them had been taken away without their permission, so they weren’t wholly themselves anymore, right?! But, they didn’t seem to mind much and I guess it gives both of them more freedom to pursue different options, more opportunities to be together and be happier with their climate, Jack doesn’t have any excuses for not visiting CA anymore and trying to please Kat for a change, and Penny did seem to come into her own and fit better with the Stork destiny, so how can I complain? If everyone’s happy, I guess I’m happy :) (hide spoiler)]). But, overall, I enjoyed this book/series and liked how everything came together and wrapped up so well!! So with a heavy heart I say goodbye to a series that I have come to love. While I always felt so much more could have been given to this stories it was a light hearted read that never made me think to hard. Finally our heroine Kat gets her happy ending. She is still madly in love with Jack (who I still frankly feel is the worst choice for a love interest), her mom and Larry are happy while little Leira is safe and happy. To top it off Ragnorok has been thwarted wooooo. Alas comes my issues with th So with a heavy heart I say goodbye to a series that I have come to love. While I always felt so much more could have been given to this stories it was a light hearted read that never made me think to hard. Alas comes my issues with the book and frankly the whole series- the barely half a page climax of the stories struggles. Any person who has taken a writing class knows the usefulness of having a good climax and spending the book building up conflict and struggles until the resolution is met. Yet in this series the conflict is constantly built up via the three of Ragnorok and the potential distraction of our world by some very angry goddesses so naturally one would expect some crazy one chapter long fight where Kat is using all her powers to save the world. Instead, no we have her cowering behind a car while the goddesses threaten the world, Jack pitching up uses his powers she spend a paragraph explaining in the most round about way possible that she must sacrifice herself AND THEN some magical handmaiden pitches up causing some sort of confusing and all the magic people disappear. END OF THREE FLIPPING SERIES WORTH OF BUILD UP! ARE YOU BLOODY KIDDING ME? Yikes, this last book in the Stork trilogy was such a let-down. I still think the mythology in these books is fascinating, but the ending to this story just left me so unhappy. (view spoiler)[First off, I have NO idea what the hell happened at the end. I know that sounds ridiculous, but I cannot tell you how Kat stopped the queens and how her sister got spared. I flipped back and forth between the pages a few times but I'm still totally lost. I felt like this during the big climactic scene in the Yikes, this last book in the Stork trilogy was such a let-down. I still think the mythology in these books is fascinating, but the ending to this story just left me so unhappy. (view spoiler)[First off, I have NO idea what the hell happened at the end. I know that sounds ridiculous, but I cannot tell you how Kat stopped the queens and how her sister got spared. I flipped back and forth between the pages a few times but I'm still totally lost. I felt like this during the big climactic scene in the second book, as well. I'd feel dumb, but it looks like lots of other reviewers have said the same thing. I am extremely disappointed that Kat lost her Stork powers. How is that a happy ending!? I'm also annoyed that this amazing gift was a background to this trilogy instead of at the forefront. It was an extremely unusual power that I'd never read about before, and I was dying to understand more about it. I was holding out hope that this last book would give us more information and fill in some gaps but it did just the opposite. I'm more confused now on how the whole thing works than I was in the first book!